Signed Exclusive Edition - Waterstones exclusive jacket (red foil on the author name rather than gold): Matching exclusive red sprayed edges: Exclusive specially designed endpapers. Without fear, there's no challenge. Without challenge, there's no growth. Without growth, there's no life. 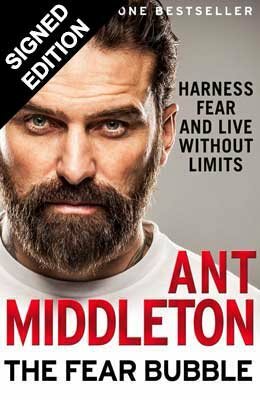 Ant Middleton is no stranger to fear: as a point man in the Special Forces, he confronted fear on a daily basis, never knowing what lay behind the next corner, or the next closed door. In prison, he was thrust into the unknown, cut off from friends and family, isolated with thoughts of failure and dread for his future. And at the top of Everest, in desperate, life-threatening conditions, he was forced to face up to his greatest fear, of leaving his children and wife without a father and husband. But fear is not his enemy. It is the energy that propels him. Thanks to the revolutionary concept of the Fear Bubble, Ant has learned to harness the power of fear and understands the positive force that it can become. Fear gives Ant his edge, allowing him to seek out life's challenges, whether that is at home, pushing himself every day to be the best father he can be, or stuck in the death zone on top of the world in a 90mph blizzard. 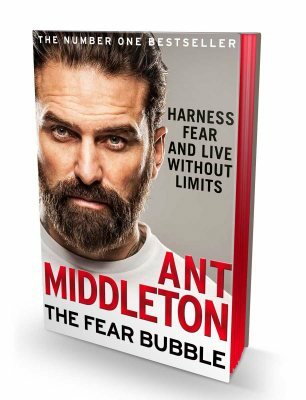 In his groundbreaking new book, Ant Middleton thrillingly retells the story of his death-defying climb of Everest and reveals the concept of the Fear Bubble, showing how it can be used in our lives to help us break through our limits. Powerful, unflinching and an inspirational call to action, The Fear Bubble is essential reading for anyone who wants to push themselves further, harness their fears and conquer their own personal Everests.